Why Do Snapdragons Come Back Each Year in Different Colors? I have lived in my house for almost three years now. I have planted a lot of flowers, shrubs, and other plants since moving in, but I have never planted snapdragons. Yet, somehow, last year two little snapdragon plants mysteriously appeared near my downspout and water meter. I thought that was what they were, but since they popped up out of nowhere, I had to consult a gardening friend to be sure. 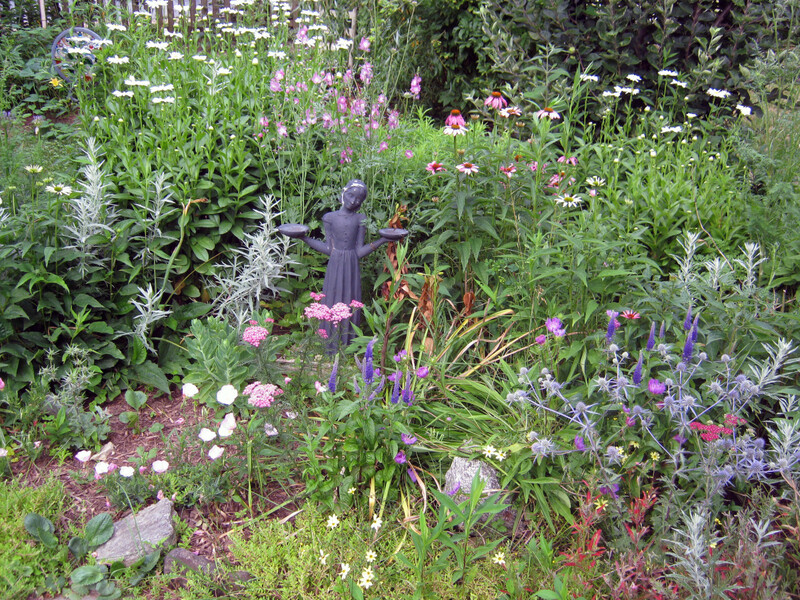 They didn’t exactly belong in that place—I would probably never plant anything there—but we loved them. My daughter would even water them every morning after they started to bloom. 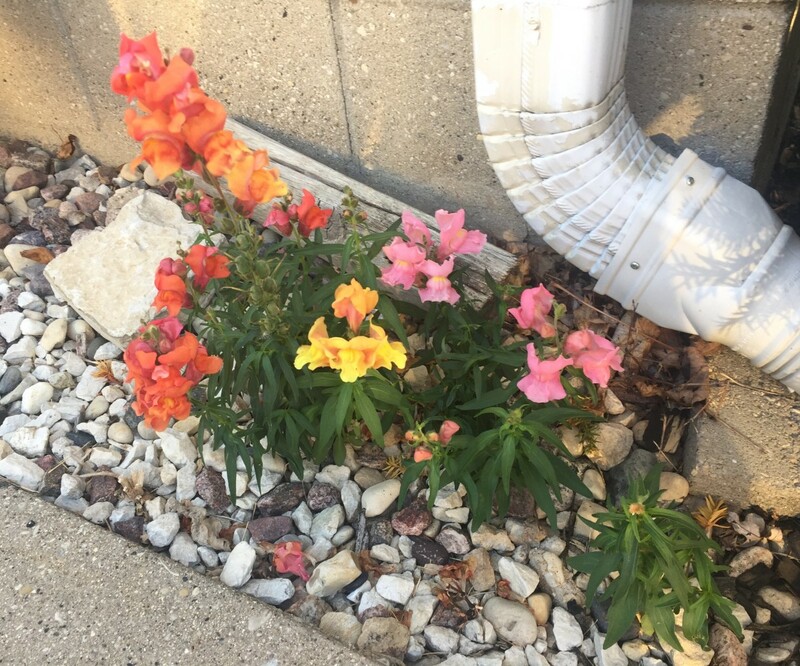 Here we are a year later, and I now have a thicker snapdragon planting in the same place, and four different colors! I literally have done nothing to the plant since last year. I was sure that winter would kill last year’s snapdragon, and that this pleasant surprise was just a one-time thing. After asking around, it turns out that others, too, have experienced these phenomena with snapdragons. 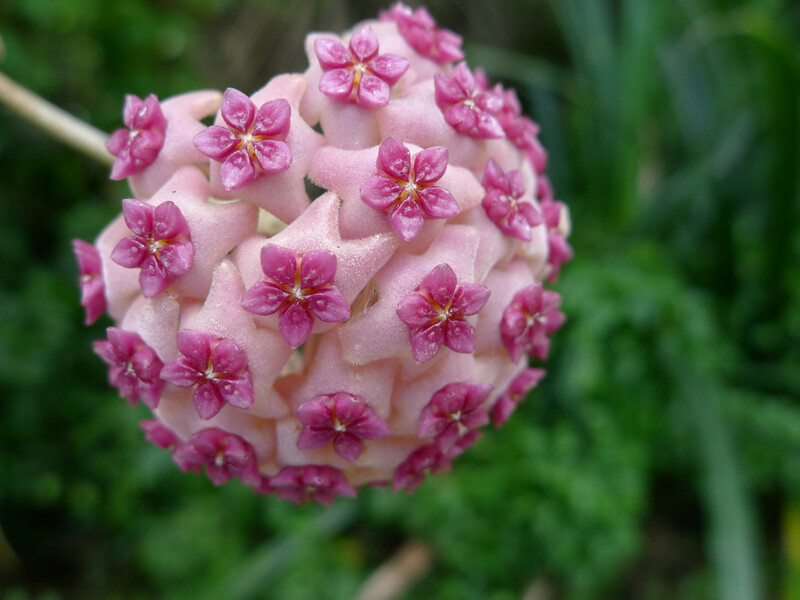 I sought out to explain why these beautiful little flowers can pop up in unexpected places, and in unpredictable color combinations. Snapdragons, or the Latin Antirrhinum, are spiked flowers with small blooms running along a single stalk that first open at the bottom of the plant, then up to the top. They are usually classified as annual plants, since they are only hardy in the hottest parts of the country (USDA Agricultural Zones 8 and 9). They can grow anywhere from a foot tall to three to four feet tall, depending on the variety. Some dwarf varieties may grow only up to six inches tall. 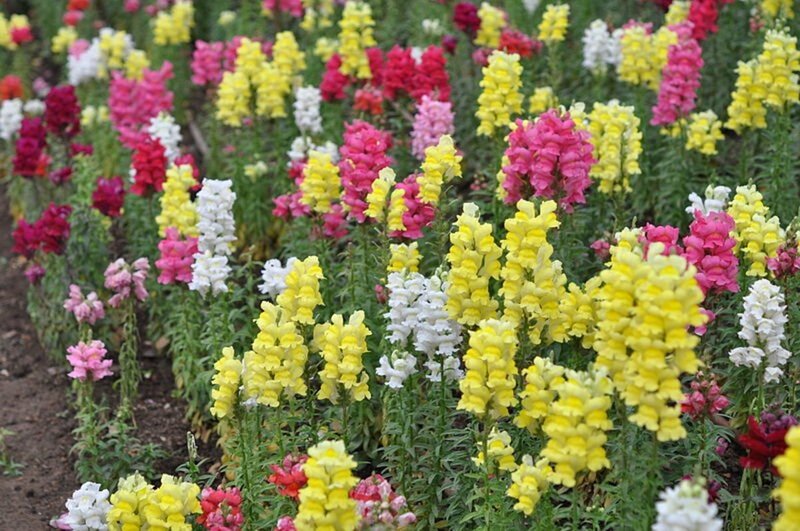 Snapdragon flowers come in an extremely wide variety of colors. Apart from true blue, snapdragons are literally found in every single other color, and sometimes bicolored a blend of hues. In many cultivars, the middle of each bell-shaped bloom will be a darker color, and the outside of the bloom a lighter color. The most common colors are light pink and white. Snapdragons get their common name from the shape their blooms make when pinched. If pinched on either side, the flowers “open” their mouths and resemble a dragon’s face. Their Latin name translates literally to “like a snout,” and refers to the exposed seed pods when the flower has browned and fallen off. The dried seed pod actually more closely resembles a human skull. Scientists are unsure of the geographical origin of the snapdragon, but many think it was originally a wildflower found in the forests of Spain and Italy. They were commonly grown in the Roman Empire. Snapdragons were likely introduced to North America when Europeans began to settle there. One of the first times the flower was mentioned in the United States was when Thomas Jefferson grew it at his home in Monticello. Old European lore refers to snapdragons as a symbol of both deception and graciousness. Medieval women would wear it if they wished men to stay away from them. Later on, it became popular in Victorian gardens. It is now a popular cottage garden flower. 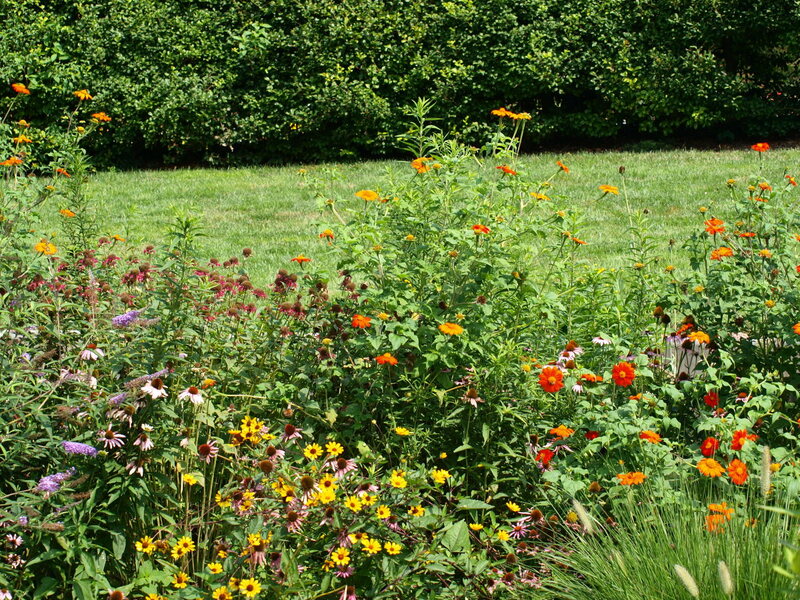 They attract bumble bees to the garden, and give off a pleasant fragrance. How do snapdragons keep coming back? Snapdragons propagate either by seed or cuttings. They are considered a “self-seeding” annual. When left alone, seeds from spent flowers will fall to the ground, survive the winter (up to -30 degrees! ), and come back the next year as new plants. If you are not lucky enough to have snapdragons magically appear on your property like I was, seeds can also be purchased from any garden store, and many beautiful hybrids are available. To plant snapdragon seeds, you can either start them indoors or directly sow them outside. If starting indoors, space them according to the package directions evenly on top of a seed starting mix or vermiculite. Watering them from below is ideal. Make sure the mixture stays moist. After about 1 to 2 weeks, the seeds should germinate. Plant the strongest seedlings outdoors after there is no longer a chance of frost. If sowing seeds outdoors, they should be sown after frost. If grown this way, they will likely bloom later in the season than those started from seed. 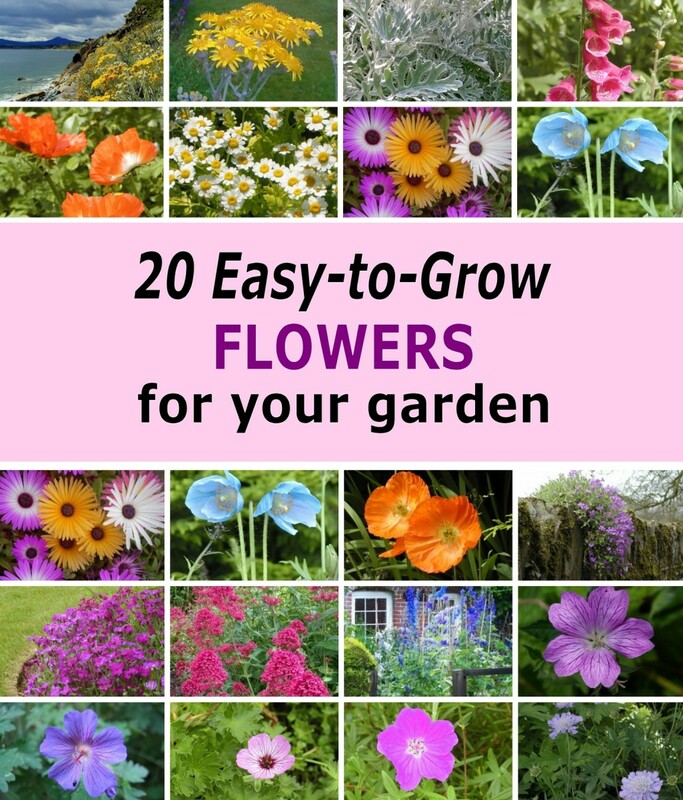 For either method, to get the bushiest blooms, pinch back leaves and deadhead blooms regularly. Snapdragons can also be grown from cuttings. To propagate this way, cut stems in spring or summer at a 45-degree angle, and plant indoors in seed starting mix, vermiculite, or course sand. Use rooting hormone if desired, but it’s not necessary. After a few weeks, the stems should root, and can be hardened off to move outdoors to a permanent location. Now to answer the question, how did snapdragons appear at my house without me planting them? Aside from seeds falling from original plants and becoming “volunteer plants” the following year, seeds can travel and make their way through the neighborhood. 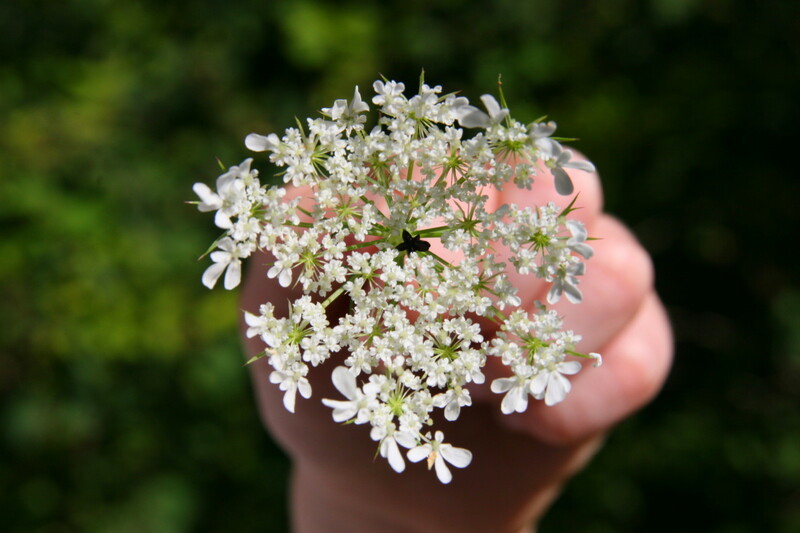 Many seeds from many types of plants are distributed by wind dispersal. What likely happened was that a neighbor of mine had snapdragons growing, and the seeds released from the plant when a gust of wind came through. A bird could have also picked up seeds from a spent flower and carried it over to my yard. Wind dispersal is the primary reason that gardeners who deliberately grow snapdragons end up with the flowers in odd places the following year. The seeds seem to end up in rocky places. Some gardeners (like me!) may consider these unlikely plants a pleasant surprise and keep them, while others may consider them a nuisance and will get rid of them. Like many flowering plants, snapdragons prefer full sun, cool soil, and plenty of organic material. 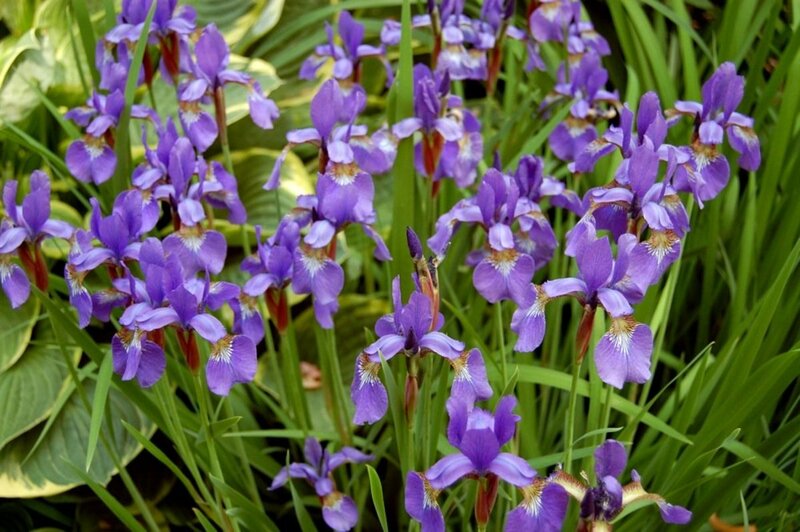 Depending on the variety, smaller types should be spaced six inches apart, and intermediate to larger varieties ten inches apart. 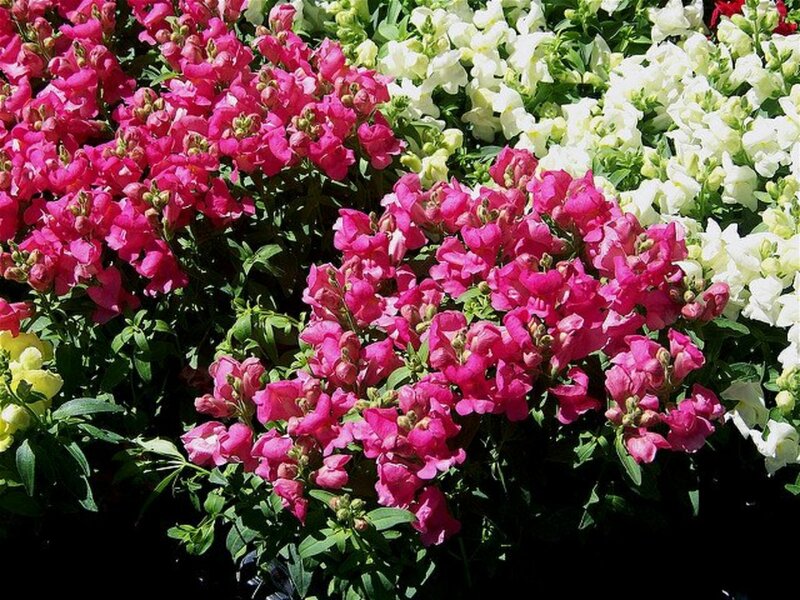 Avoid planting snapdragons too close to each other, which can encourage mildew and fungus growth. When seeding themselves, snapdragons seem to automatically space themselves appropriately. Each of my four little snapdragons that came back this year are about six inches apart. Snapdragons enjoy regular watering and a good all-purpose fertilizer. I have done nothing at all to my snapdragons that keep coming back, but as they continue to thicken I plan on using the same fertilizer I use on my other flower beds next year. Another question left unanswered: how do snapdragons keep coming back in different colors? Like I mentioned before, one year I had pink ones, and the next I had red, orange, yellow, and pink. How did this happen? My original hypothesis was that snapdragons, like hydrangeas, are affected by soil pH. This is not the reason for color change in snapdragons, however. Many are hybrids, and seeds won’t produce colors true to the parent plant. 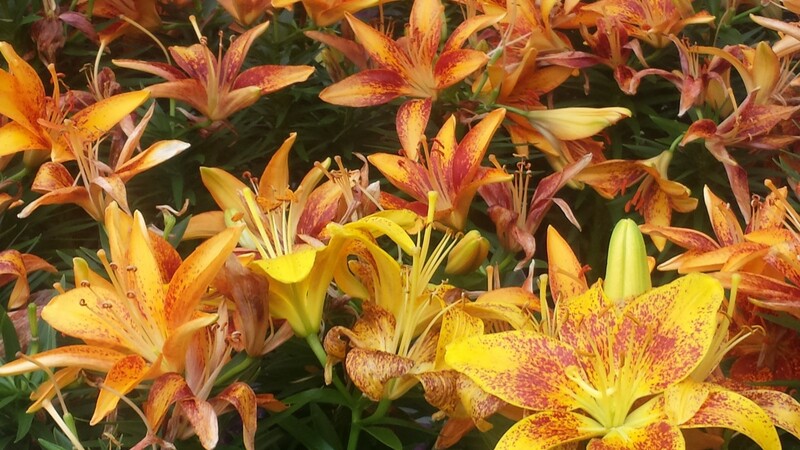 If flowers are cross pollinated with pollen from a different colored plant, the new plant will inherit qualities from both “parents.” In some cases, this results in a pretty new shade. In others, it can result in a muddied or not-so-attractive brown shade of snapdragon. Therefore, if you decide to save the seeds from your snapdragons, or decide to let them reseed naturally, don’t expect the same color flower to come back next year! 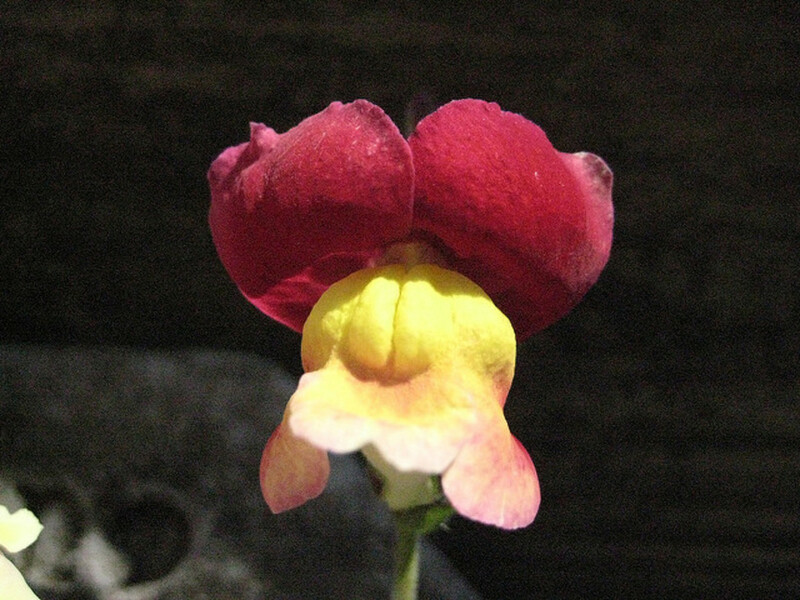 Snapdragon color follows a genetic model of incomplete dominance. In fact, it has commonly been used in classrooms and other controlled studies to examine genetic behavior. Unlike other species who only inherit one or the other traits for certain characteristics from their parents, snapdragons can inherit a blend of traits from each parent. For example, if you cross pollinate red and white snapdragon plants, traditional genetics would assume the new seeds would produce red plants (assuming red is the dominant trait). That is not the case—because of the incomplete dominance in snapdragons, the new seeds would produce plants with pink blooms. 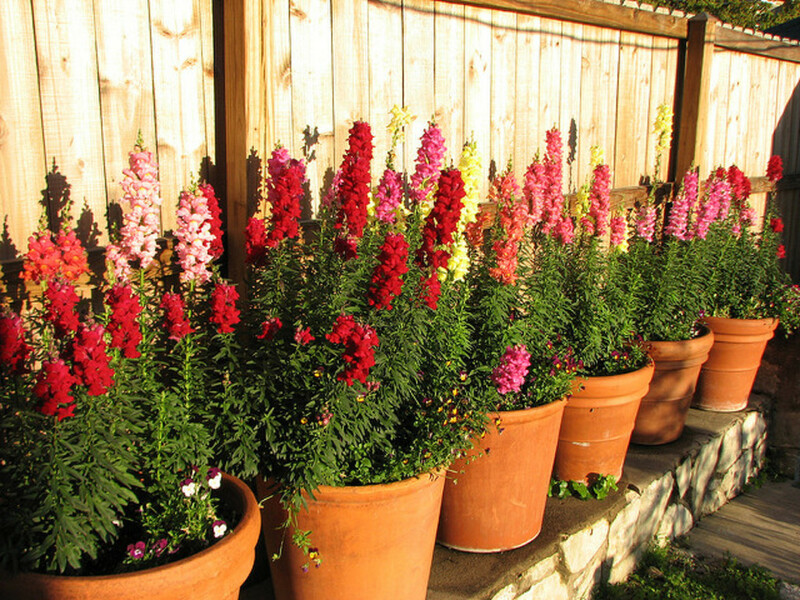 Snapdragons can make a great addition to any landscaping, and grow very well in containers, too. Whether you plant the deliberately or have them show up as welcome visitors, snapdragons are an easy to care for plant that add delightful color to any garden.